Released a few years after Kurt Cobain's death, this record was a shining light in the otherwise bleak musical landscape of 1996. For me, at least. Enough time had passed to process the loss of the band, and an official live album from the band seemed like a fine idea. And it was. While the Unplugged album was a nice, solemn note for the band to end on, I for one was ready to remember the band as the screechy, scratchy, loud and uneven band that they really were. This record is perfect for that. Krist Novoselic assembled this thing, and he clearly intended to not leave any soft spots. 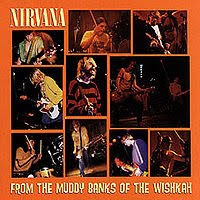 "Polly" is the closest thing to the mellower side of Nirvana, but after the opening chords, they launch into a fast and heavy version of the song. Good stuff. As I mentioned, the loudness is all-encompassing. It's a heavy album, and almost relentlessly so. I can get with that. The recording quality is awesome, and the performances seem untouched. Some of the tracks are sloppy, but that makes it seem even more legit. I wasn't initially excited to see "Smells Like Teen Spirit" on here, but the version they included is awesome. It was recorded right after Nevermind came out, and the band is obviously still really into playing the song. It's not chronological. I know. Boo-hoo. Even though the performances are culled from all sorts of different shows and years, it's all blended together to sound like one long show. It makes the sound more fluid, but it's bothersome to me for some reason. It's misleading or something...? Otherwise, I love this thing. I bought this on vinyl right when it came out. The LP is sweet, because the fourth side contains nothing but random stage banter from the band - stuff that wasn't included in the CD release. It's not something I listen to more than every other year or so, but it's cool to have. This hasn't ended up being one of the more in-demand Nirvana records, but it's relatively hard to find. And until recently, it was the only official Nirvana live album, not counting Unplugged. So that's pretty sweet. Definitely one of my favorite live records. 1996 was bleak? Are you insane? Unwound-Repetition. Satisfact-The Unwanted Sounds. A Minor Forest- Flemish Altruism. The Melvins-Stag. Imperial Teen-Seasick. Inch-Dot Class C. Halo Benders-Don't Tell Me Now. Ghostface Killah-Ironman. The Feelings-Especially For You. Oh, how I could go on. '96 was a magical year for music. I should have said "popular music," or the stuff on MTV or something like that. But still, I stand corrected. Now I see where you're coming from. I always mark 96-97 as the end of any decency in popular music. That's the time period where the Spice Girls and Backstreet Boys came out and re-conquered the music world for crappy bands everywhere. I remember a year earlier reading a magazine in high school (in a class I mean) and it was about how Backstreet was going to be the next big thing. I scoffed. I was wrong. So so wrong.